When the title alone doesn't tell the story, customize your Task Board cards to show all the most important details. Project keeps a running list of where you've saved other projects. When you're ready to save your project, just choose one of your Recent save locations and get on with your day. Not an Office 365 subscriber but using Office 2016 or 2019? Find out what's available in your version. See what's new and improved in the July 2018 feature update Version 1807 (Build 10325.20082). Take a look at what's new in Version 1806 (Build 10228.20080). 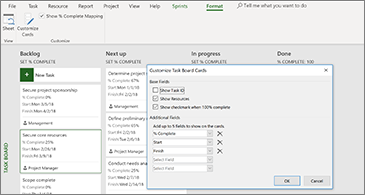 Take an agile approach to working with Task Boards. Go to Manage Sprints to add and remove sprints as your project evolves. See what's new and improved in the May 2018 feature update Version 1805 (Build 9330.2087). For an at-a-glance view of all your sprints, click Project > Agile > Scrum > Manage. Quickly add, update, or delete them right from there. See what's new and improved in the March 2018 feature update, Version 1804 (Build 9226.2114). If you're using Project Online Desktop Client, you can filter your Task Board view to see tasks related to either a specific resource or summary task. You can also use these filters when viewing Sprint or Kanban boards. On the View tab, choose Task Board. In the upper right of this view, select the filter button. Select the down arrow next to Summary Task (0) or Resource (0), and choose from the list. You can choose multiple summary tasks or resources to filter by. In Project Online Desktop Client, the Set % Complete field in Task Board, Sprint, and Kanban views allows you to update percent complete for tasks when you move them from column to column. This percent complete will persist in your Gantt Chart view as well. Open a Project file and on the View tab, choose Task Board. You can also use Set % Complete in a Sprint or Kanban board. 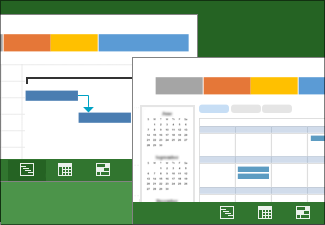 For more on how to use these, see Use agile in Microsoft Project Online Desktop Client. On the task board, select Set % Complete below a column name and enter a value, such as 50. Move a task into that column. When you open the task, you'll see that the Percent complete for that task now matches the column's percent complete. On the Task Board Tools: Format tab, clear the Show % Complete Mapping check box. In Project Online Desktop Client, you can more easily switch between sprints, identify your current sprint, and move tasks forward to the next sprint. Open a project that uses sprints and go to the Agile Tools: Scrum tab. 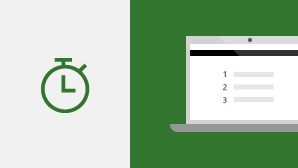 For more on using sprints in Project, see Use agile in Microsoft Project Online Desktop Client. 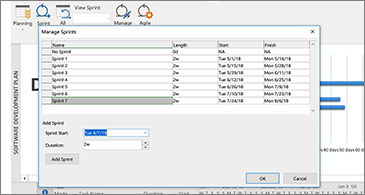 In the View Sprints drop-down box, choose the sprint you want to view. Right-click a task and choose Move to Next Sprint. See what's new and improved in the October 2017 feature update, Version 1710 (Build 8625.2055). If you're a Project Online subscriber, you can manage your projects and tasks using simple, visual task boards that support Scrum, Kanban, or custom workflows. You can turn on agile views for a current waterfall project, or create a new agile project from the File > New page. Using the Agile Tools tab, you can see board and list views, and switch back and forth between waterfall and agile views of the same tasks. Project also provides several agile-specific reports such as task status and sprint status. For more details, see Use agile in Microsoft Project. Not committed to agile project management but still want to see your project tasks on a board? 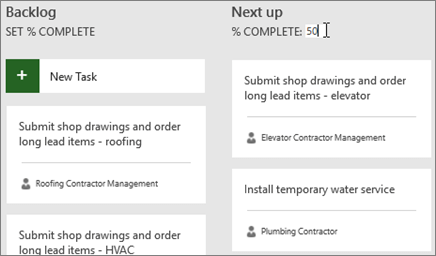 If you're a Project Online subscriber, you can see all your Project tasks laid out like cards on a board using Task Board view. Move task cards from column to column, name your own columns to create a custom workflow, and . In Project, on the View tab, in the Task Views group, choose Task Board. To change the name of a column, right-click the column name, choose Rename, type a new name, and then press Enter. To add more columns, to the right of the last column, choose Add New Column, type a name, and then press Enter. Important: The column headers in the Task Board view are the same as the column headers for the agile tools in Project. So if you are using both agile and Task Board view, whatever changes you make to the column headers will show up in both views. 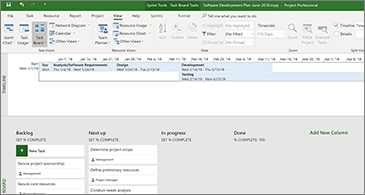 If you're a Project Online subscriber, you can link a task in Microsoft Project to a plan in Microsoft Planner. In Planner, you can break the work down, build a team, assign tasks, and update status in an easy to use task board view. 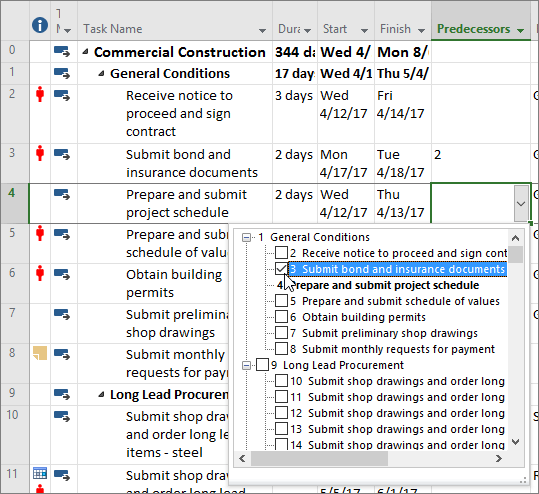 Select a task in Project, and then click the Planner button on the Task ribbon. In the Link task to a plan pane, search for the group that your plan belongs to, and then choose the plan you want to link to from the list. Your Project task is now linked to that plan, and the task owner in Project becomes an owner of this plan in Planner. See what's new and improved in the March 2017 feature update, Version 1703 (Build 7967.2139). You no longer have to remember the ID of the task you want to link to. Instead, when you select a cell in the Predecessors column, and then select the down arrow, you'll see a list of all the tasks in your project. The task hierarchy and order matches your project exactly, making it easy for you to scroll to the right task and then select the check box beside it. You can also select tasks from the same kind of drop-down in the Successors column. For more details, see Link tasks in a project. See what's new and improved in the January 2017 feature update, Version Version 1701 (Build 7766.2060). With long lists of tasks, it can be difficult to know what a task is indented under in the overall project plan. The Task Summary Name field is a read-only field that shows the name of a task's summary task. Adding this field as a column in your Task view can help clarify your project's structure. To add this field, right-click the title of a column (to the right of where you want to add the field), select Insert Column, and then choose Task Summary Name from the drop-down list. See what's new and improved in the November 2016 feature update, Version 1611 (Build 7571.2072). Communicating project progress just got easier! Timeline bars can now be labeled, and task progress is shown right on the tasks themselves, making it simple to quickly illustrate your plan and the work in progress when sharing status. See what's new and improved in the October 2016 feature update, Version 1610 (Build 7466.2038). Have a comment or suggestion about Microsoft Office? We need your feedback to help us deliver great products. 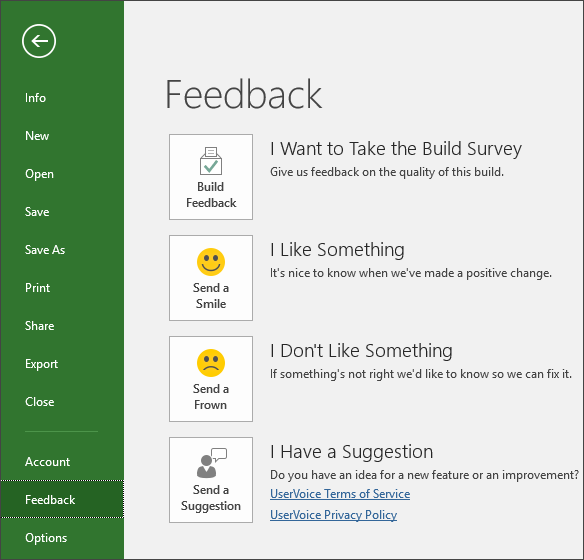 In Project, you can suggest new features, tell us what you like or what's not working by clicking File > Feedback. 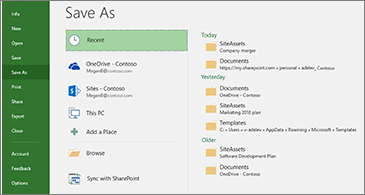 See what's new and improved in the September 2015 feature update, Version 1509 (Build 4229.1024). Want to learn more? Here's how to create timelines in Project 2016! 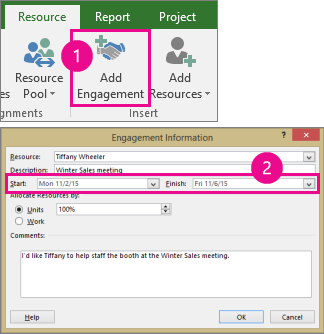 Important: Resource engagements only work if you're using Project Professional 2016, connected to Project Online. If you are not connected to Project Online, the resource engagements functionality will be hidden from view. Project Standard 2016 does not include resource engagements. When a project manager decides to use one of these resources on a project, he or she submits an engagement request with the date range for when the resource is needed, and either a certain percentage of that resource's time during that date range, or a set number of hours during that date range. The resource manager reviews this request, and can accept it, suggest changes, or reject it. 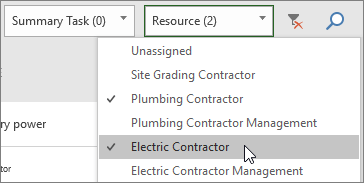 The project manager refreshes the engagement status in the new Resource Plan view in Project Professional 2016 to see the resource manager's response. 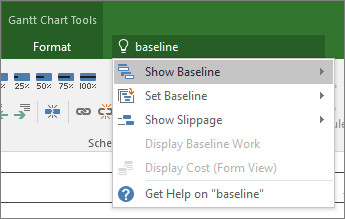 You'll notice a text box on the ribbon in Project 2016 that says Tell me what you want to do. This is a text field where you can enter words and phrases related to what you want to do next and quickly get to features you want to use or actions you want to perform. You can also choose to get help related to what you're looking for. 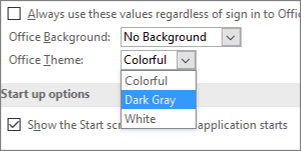 There are now three Office themes that you can apply to Project 2016: Colorful, Dark Gray, and White. To access these themes, go to File > Options > General, and then click the drop down menu next to Office Theme.